We have compiled a list of Do’s and Don’ts by the top famed makeup expert Mr. Martin (Marty) Dingerman of the prestigious Walgreen’s Cosmetic Department. Marty, with his great wealth of knowledge in everything color and texture has agreed to sit down with the editors of VAGUE to share with us the same unheard of skill that turned our cover model Ruth into the iconic unforgettable woman. VAGUE: Thank you for joining us Mr. Dingerman. We know you are pressed for time, so we thank you for spending your 15-minute coffee break with us today. MARTY: Sure. No problem. If someone has a return to make, I might need to go and deal with it. But..umm let’s just get going here because I have a guy that called in sick I need to get back out on the floor. VAGUE: Yes, I understand. Please share with us the number one mistake that the more MATURE woman over seventy makes on a regular basis? MARTY: We see them older gal’s come in here and stock up on anything that’s been marked to 75% off. They think that’s the way to choose makeup. The truth is..the reason we marked it to down in the first place was because we can’t even sell the teenagers green lip stain or orange blush anymore. They all go to Sephora or some other ritzy conglomerate. I guess these older ladies can’t see that it’s green. Then they get it home and put it on. I try my darnedest to steer them in the direction of a nice beige or sand..Cover Girl has a nice one. They just don’t want to shell out $7 bucks for it. I seem to have this uncanny knack for finding just the right shade of lipstick for a pasty wrinkled skin type.. VAGUE: I’m sure you do. What is the number one beauty secret to looking unforgettable? MARTY: I’d have to say remember to wipe all the crap gunk off your face before you go to bed. If you don’t remember things anymore because you have “what duh ya call it..?” Alzheimer’s, (like my mother-in-law, Ruth) then have your Nursing Home write it in the care plan so it gets done. Some of these gal’s won’t even use anything other than CRISCO to get it off. I don’t think that’s a good idea. I’d stay away from the Irish Spring Body soap too. Much too drying. You sure don’t need your wrinkles to get wrinkles now do you? VAGUE: And on that note.. we say a thank you to Mr. Martin Dingerman for the deep knowledge he’s shared with us today. We now have some great new direction to explore in our daily beauty routine. 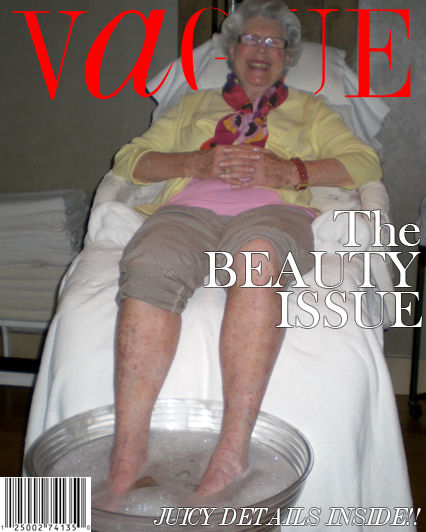 If you have any priceless pearls of wisdom to share on maintaining your unforgettable look, ask your nurses aid or advocate or your daughter to help you with an e-mail to the editors at VAGUE.